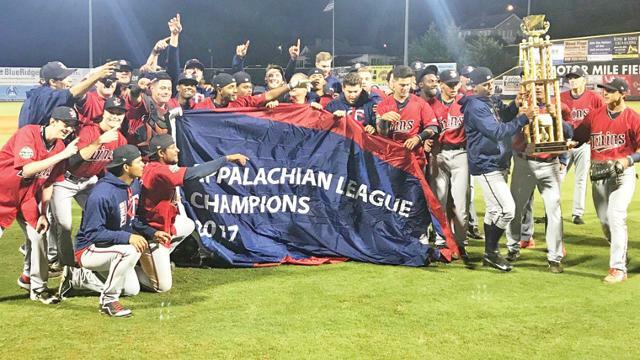 Photo by Appalachian League The Elizabethton Twins hold up their championship banner after becoming the 2017 Appalachian League champions Friday with a 8-7 win at Pulaski. The Elizabethton Twins were able to get it done in two. After dominating Pulaski 12-1 Thursday at Joe O'Brien Field during game one of the championship series, Elizabethton held on for an 8-7 win at Pulaski Friday to claim its first league title since 2012. Twins pitcher Jovani Moran picked up the save Friday. Moran tossed the final two innings as the Yankees needed one run to tie things up. Moran finished with four strike outs as he held the Yankees at bay. Elizabethton's Moises Gomez (1-0) was awarded the win as he tossed five innings during which he had three runs and four hits against him. He would finish with six strikeouts against three walks. Both Pulaski and Elizabethton finished with nine hits. Twins Akil Baddoo, Mark Contreras, and T.J. Dixon all finished with two hits each. Contreras had a 3-run homer in the third inning. Elizabethton's Carson Crites, Rainis Silva, and Gorge Munoz all recorded hits Friday. Elizabethton took an 8-3 lead after four innings before the Yankees rallied for four runs in the seventh inning to cut it a 1-run game.